We'd love to have your friends, relatives, and colleagues join the world's best breakfast conversation: 1-click sign-up here. 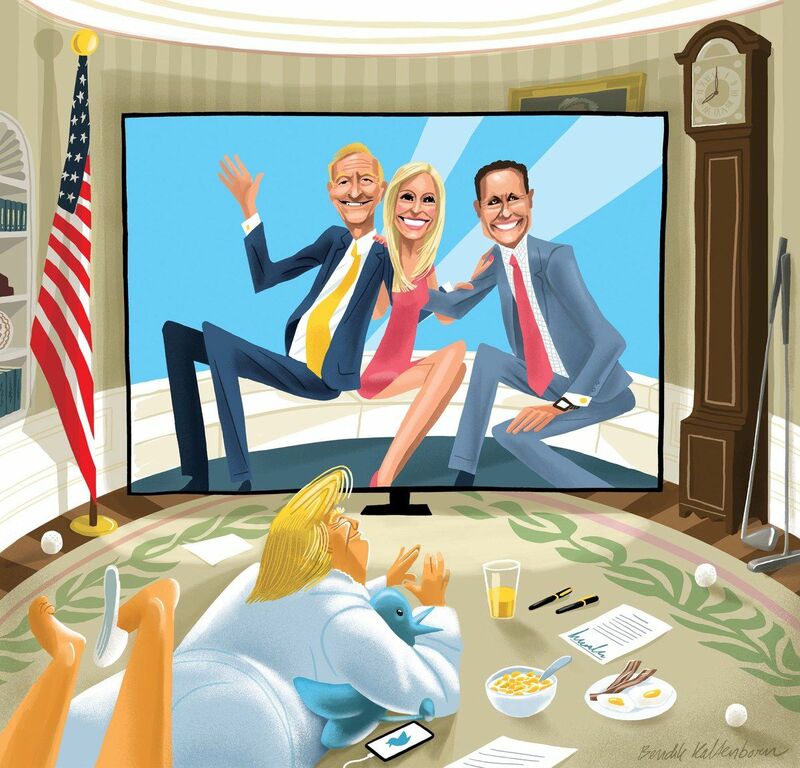 Illustration by Bendik Kaltenborn / The New Yorker, from "How 'Fox & Friends' Rewrites Trump’s Reality." Used by permission. 1. Fox News — especially the morning show, "Fox & Friends." It’s no exaggeration to say that the "Fox & Friends" anchors and commentators have become de facto policy advisers. 2. Sinclair Broadcast Group, the nation's largest owner of local broadcasting stations, with unabashed conservative leanings. Trump backed the company in a tweet yesterday after an embarrassing viral mash-up showed dozens of Sinclair anchors on at least 66 stations around the country reading a canned promo script denouncing "fake stories" on "some media outlets." Trump's feedback loop — including cable-news coverage, and mainstream media squawking — convinces the president that he's winning his war on media. "We cannot and will not allow voices to be censored by agenda-driven intimidation efforts," the statement said. CNN's Brian Stelter said that's a reference to the liberal Media Matters for America. New privacy rules in Europe are also a template. Ripple effects: Other online platforms won't get out of this unscathed. Regulatory proposals can be expected to drag in the likes of Google, Twitter, Snapchat, Amazon and Microsoft, who'll have to explain why they're different from Facebook. Data portability: Giving consumers the ability to yank their data from any company at any time is getting some traction. Transparency: Requiring companies to clearly disclose how they are collecting, using, and sharing consumers' data. Opting in: Facebook has said it will give users more control over how information is shared with third-party apps and will clarify privacy settings. "Any American company that wants to be a global player cannot afford to lose access to China’s growing market, executives say." "Technology companies argue that the restrictive measures the administration is taking to help protect them could end up penalizing American manufacturing, raising costs and making their companies less competitive globally." "And industries most vulnerable to retaliation, like agriculture, are protesting about losing valuable export opportunities." 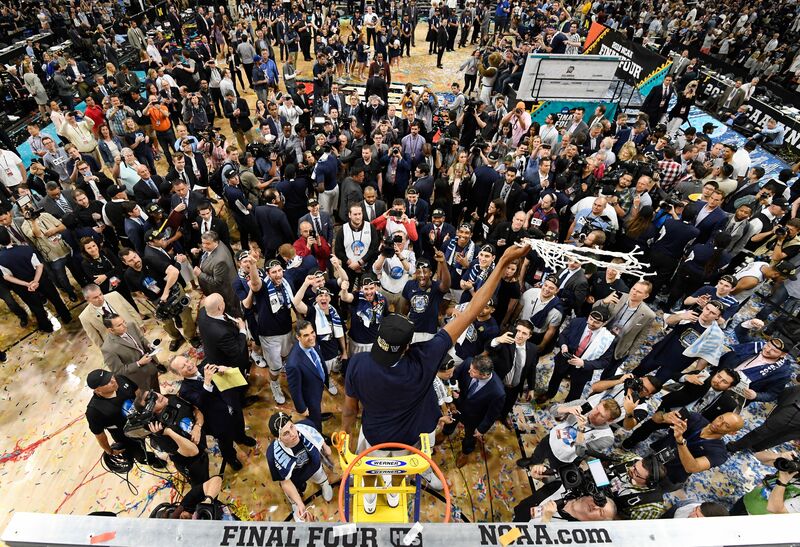 Confetti falls as the Villanova Wildcats celebrate after defeating the Michigan Wolverines, 79-62, in the NCAA men's basketball national championship in San Antonio. Below, Villanova's Mikal Bridges (a potential NBA lottery pick) celebrates with the net. Shot — The Times of London: "Moscow has said that relations with the West are now worse than during the Cold War in the aftermath of the Skripal poisoning." "Sergei Lavrov, the Russian foreign minister, claimed that unwritten codes of conduct between the Soviet Union and the western powers during an era of mutually assured nuclear destruction no longer applied, suggesting that the modern relationship was more volatile and unpredictable." Chaser — WashPost A1: "Trump proposed meeting Vladimir Putin at the White House in [his congratulatory] phone call [on March 20], the Kremlin said, ... a fresh revelation about a conversation that stirred controversy over Trump’s friendly tone toward the Russian leader amid mounting tensions with the West." 6. "As Wall Street sinks, Trump is his own worst enemy"
"The selling was sparked by escalating fears of a trade war ... and by Trump’s renewed criticism of Amazon." Doug Kass, president of Seabreeze Partners Management in Palm Beach: “The president’s behavior is now beginning to impact the capital markets — both the averages and individual equities." "Financials down 10.6% from Jan. 26th 52-week high." "Dow, S&P and NASDAQ close in correction territory." "20% of S&P's tech sector enters bear market territory." "It’s a move reminiscent of Tesla’s last vehicle launch — the Model X — when Musk famously kept a sleeping bag near the production line so he could immediately address any hiccups." "The posts ... came as investors await Tesla’s first-quarter production numbers, which are expected to fall short of the company’s forecasts." Musk: "Car biz is hell." "Major CFPB rules would need congressional approval, ... and the CFPB’s director would answer directly to the president, instead of being fully independent. Its funding, which currently comes from the Federal Reserve, would be handled by Congress." Mulvaney in a report to Congress: “The bureau is far too powerful, and with precious little oversight of its activities." Why it matters: "The changes would be a substantial departure from the CFPB’s structure, which currently gives it wide latitude to oversee consumer financial products without interference from Congress or the White House, and make it less independent than other banking and markets regulators." Go deeper: Axios' Michael Sykes, "Why teachers are walking out of the classroom." "The percentage of K-12 public schools that prohibited cellphone use was about 66% in 2015-16, down from more than 90% in 2009-10, according to data from a survey conducted by the National Center for Education Statistics." "Among high schools, the shift over the same period was especially striking — dropping from 80% with bans to 35%." "The nation's largest school system, New York City, is among those that have abandoned strict bans, which had some students paying $1 a day to store phones in specialty trucks parked nearby before heading into school."